For some research projects, it might be necessary to adjust the sample share of one product so that it matches the population share. More often this adjustment is required for a larger number of products which, typically but not necessarily, have shares adding up to 100% among them. assessment of the proportion of medical treatments prescribed by a doctor to his/her patients in the last month. In these circumstances, respondents need to be assigned a weight so that the sample stated shares for the set of products under investigation match the population shares. This process, usually referred to as share weighting, is required to ensure that the sample is representative in terms of products adoption/usage. Share weighting is especially important when respondents provide information about both current (past) usage and future intentions: by weighting respondents on current usage it is possible to use future intentions to get an accurate estimate of future usage which can be used for forecasting purposes. It is important to adopt a powerful, robust, and validated share weighting algorithm which should also produce clear and exhaustive summary statistics to allow the user to assess the quality of the weighting and to review the weighting process if necessary. Sometimes weights could be too strong (e.g., a weight larger than 10) or too weak (e.g., a weight smaller than 0.1). A large weight means that the information provided by some respondents have a large impact on the results, while a small weight means that some respondents are almost uninfluential. It is important to being able to assess the quality of the weighting process and to take corrective actions if required (e.g., combining some of the weighting variables). 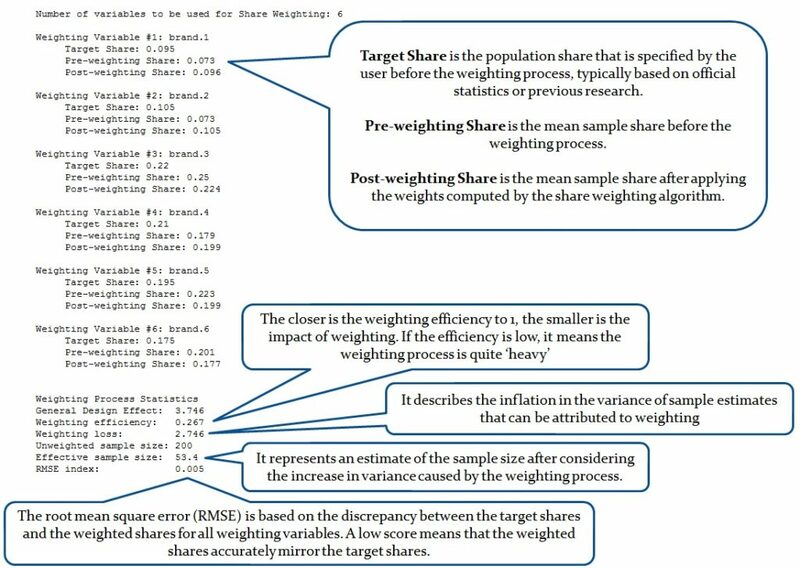 The function share.weighting available in R-sw Discriminant allows computing respondents weights based on products shares. It is based on a robust algorithm and produces a detailed summary report. Restrictions for the weights can be specified (i.e., minimum and maximum values) and weighting variables could be weighted down to zero if required. R-sw Discriminant is the only commercial software that allows performing both RIM and Share weightings.